Heart's Delight Cards: My First MDS Hybrid! No, it's not a fossil-fuel-sipping vehicle, it's a card made with an image I printed out of My Digital Studio! I needed the image in a hurry, and if I ordered the stamp set, it would have taken nearly a week for it to arrive. Sooo, I got the digital download of the Established Elegance stamp set instead, and instantly had the images I needed. I wasn't sure if my printer* would match the colors of the DSP and cardstock, but it did - perfectly! Just so no cardstock would be wasted, the Very Vanilla sheet was filled with the same image, with different colors chosen for each one. Now they'll be handy for future projects. * It's a Dell 2150cn Color Laser printer that can handle 110 lb. cardstock....that's what Santa brought for Christmas, and I LOVE it! Warms up super fast, prints super fast, and the print quality is amazing. Wow!! That looks amazing!! I love the ribbon with the flowers and the pearls -- just spectacular! Now just look at that bow!! GORGEOUS!! Ok, the whole card is gorgeous! You are going to make me get that hat pin, aren't you??!! Gorgeous card, Cindy! Love the colors and simple elegance. Gorgeous! 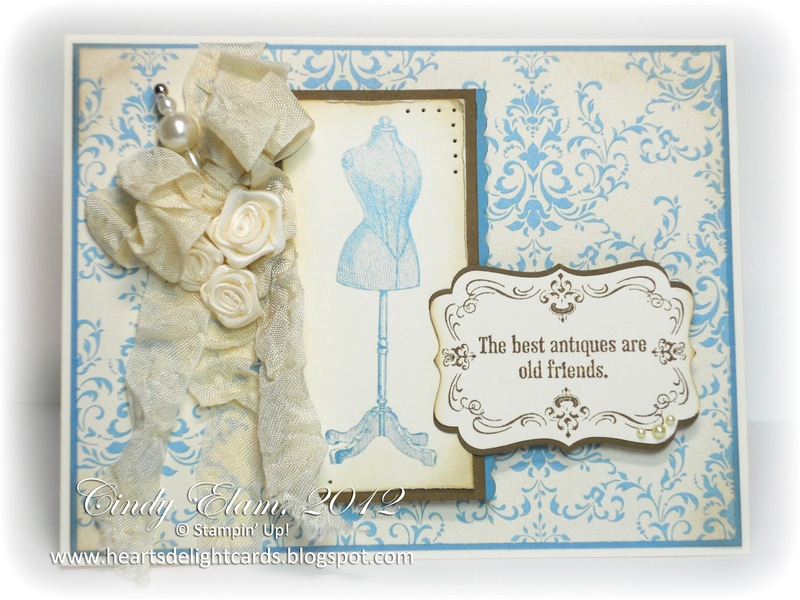 I love, love, love your ribbon treatment on this card! Awesome card! Love the idea to print several images in different colors! Thanks for the idea. Love it! U've been using MDS more and more lately!